Pennsylvania's Seven Day Wonder - Something wonderful happened in 1979. 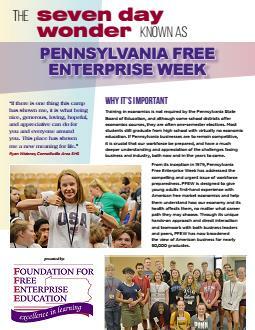 An idea was born that has since transformed itself into the internationally recognized and award-winning program Pennsylvania Free Enterprise Week-or "PFEW" as it is widely known. Clayton D. Sommers, then president of Clarion State College and later deputy commissioner of higher education, brought the idea of a practical hands-on business education program to Raymond G. Weber, then executive director of the Manufacturer's Association of Erie. PFEW was born in 1979, the Foundation for Free Enterprise Education was established as the governing body of Pennsylvania Free Enterprise Week, and in 1980 was incorporated as a 501(c)(3) educational foundation, enabling it to accept charitable contributions. Outgrowing the Clarion campus within two years, PFEW moved the site of its summer program first to Penn State University, later to Lock Haven University, and in 1990 to its current host campus of Lycoming College in Williamsport, PA. Due to its phenomenal growth, PFEW expanded to an additional host campus, Pennsylvania College of Technology, in 2008. Students come to PFEW from over 1,000 high schools throughout Pennsylvania. These students attend thanks to scholarships contributed by over 800 businesses, foundations, and civic organizations across the state. PFEW is designed to give these young people first-hand experience with American free market economics and help them understand how our economy, and its health, affects them no matter what career path they may follow. If Pennsylvania businesses are to remain competitive, it is crucial that our workforce be prepared, and, have an understanding and appreciation of the challenges that face the business and industry community both now and in the years to come. Applicants are recommended by their school and then screened by the PFEW staff. Admission is based solely on motivation to learn. Those accepted are awarded scholarships which cover all program costs, excluding a nominal registration fee and transportation to and from one of our host campuses. When students arrive for their one-week session in July or August, they are housed on campus in dormitories, thereby experiencing a real taste of college life. Before their first day is over, the students will have become members of management teams for "companies" that will determine selling prices, marketing costs, budgets for production, research and development, capital expenditures, inflation factors, financing, stock offerings - in short, all of the decisions that managing a business typically demands. Student companies compete and are judged in the areas of Management Skill, Return on Net Assets, a Marketing and Advertising campaign, and a Stockholders' Presentation. Throughout their week they will have as their consultant and mentor a "Company Advisor" - a volunteer from Pennsylvania's business community - not making decisions for their team, but suggesting available options and sharing their own experiences and challenges to help guide their young "executives." Interspersed throughout this busy and interactive week are dozens of speakers presenting world class seminars and discussions covering such topics as the relationships of business with labor, government and consumers; business ethics; management and leadership skills; the future of our economic system; the global marketplace; money and banking; business operations; careers in business; marketable skills; and many, many more. From its inception in 1979, Pennsylvania Free Enterprise Week has addressed the compelling and urgent issue of workforce preparedness. Through its unique hands-on approach, and direct interaction and teamwork with both business leaders and peers, PFEW has now broadened the view of American business for nearly 50,000 student graduates.